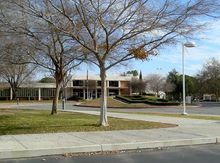 Founded in 1913 as Bakersfield Junior College, the school was initially housed on the campus of Bakersfield High School (then Kern County Union High School). In 1947, the school dropped "Junior" from its name. In 1956, Bakersfield College moved to its current location "on the hill" in northeast Bakersfield on the "Panorama Bluffs" that overlook the prolific Kern River oil field. The main campus is located on a 153-acre (62 ha) plot in Northeast Bakersfield, and it also operates three satellite campuses: the Weill Institute in downtown Bakersfield, shared by the Kern Community College District, the SouthWest Campus also located in Bakersfield, and the Delano Campus in Delano, California, approximately 35 miles (56 km) north of Bakersfield. BC is part of the Kern Community College District (KCCD). BC serves about 22,000 students each semester. The college president is Dr. Sonya Christian. The Renegade Rip is the student-run newspaper within the journalism department at BC. Published biweekly, The Rip currently has a circulation of approximately 4,000. An online edition is also available. The Rip is a regular contender and recipient of JACC (Journalism Association of Community Colleges) awards at both the state and regional levels and in 2003-2004 won the Associated Collegiate Press National Pacemaker Award. They are a member of the Journalism Association of Community Colleges and compete in the Southern California region. Rip reporters and photographers cover the campus. The students cover topics ranging from crime on campus, to student profiles, sports and local entertainment. The tradition of The Renegade Rip has always been to chase news stories and focus on what affects the student body at BC and the community of Bakersfield as a whole. The Renegade Pep Band supports the college's athletic teams. Golden Empire Performing Arts is a non-profit 501(c)(3) account of the Bakersfield College Foundation that supports the Bakersfield College Drumline and the Golden Empire Drum and Bugle Corps. The BC Renegades ('Gades) compete in the Western State Conference (WSC). The college has an extensive athletics program including: men's and women's basketball, men's and women's cross country, men's and women's golf, football, soccer, volleyball, wrestling, baseball, softball, men's and women's tennis, men's and women's track and field, and men's and women's swimming. Renegades football has a long tradition of success in Junior College-level competition, and plays out of the 20,000-seat, on-campus Memorial Stadium. For a more comprehensive list, see Category:Bakersfield College alumni. Ric Drasin, former professional wrestler, designer of the original Gold's Gym logo and the World Gym gorilla logo. George Jones (American football), former NFL running back. ^ Hooper, Ken (July 28, 2013). "History: Growing up and headed for college". The Bakersfield Californian. Retrieved November 21, 2018. ^ Claffy, Emily (July 26, 2013). "Bakersfield College Centennial: 100 years of higher education". The Bakersfield Californian. Retrieved November 21, 2018. ^ "Golden Empire Performing Arts". Golden Empire Performing Arts. Retrieved 2017-09-28.